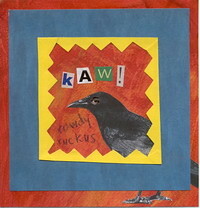 The fact that some people don’t like crows, perhaps also adds to their appeal. I remember a time when I was a kid and visiting a cousin whose dad, my uncle, was kind of scary. He was threatening to shoot some crows he considered pests, and I stood up in defence of the crows despite being intimidated by him. Recently, a friend confided to me that she finds crows unnerving. They eat road kill and stand on the road when you’re driving toward them, almost daring you to keep coming. You don’t want to swerve and cause an accident, but they don’t fly away until the absolute last minute, giving you a dirty look as they go. Crows are the bikers of the bird world. They wear the feather equivalent of black leather. They’re in your face — even rude. They hang out in gangs. They attack other birds (ravens, hawks, owls) who fly into their territory. I’ve also seen individual crows attack people (usually when protecting their nests). When my dad was about 14, he stole a baby crow out of its nest (he wanted to keep it as a pet and see if he could teach it to talk). One of the adult crows must have seen what happened. Every time my dad came out of the house after that, an angry crow would kaw and fly at his head. For years, the crow continued to pester my dad. The crow even knew when my dad got off work and would be waiting for him. Pretty smart. Perhaps crows are fascinating because they are so much like us and, at the same time, they are totally alien. Any thoughts on this? I was going to write more about crows, but I have to say something about the snow. 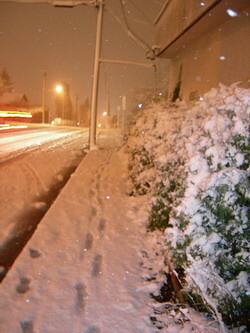 Yes, snow in November on the westcoast. Last night I was down on Robson street, and people were sitting outside at restaurants and coffee shops (the usual for a Vancouver night). By the time I walked home from the Skytrain, this is what I saw. This morning, I woke up to a world transformed. Whenever I look at an expanse of untouched snow, I’m always hesitant to make the first footprints. The white surface is like a new canvas ready for paint or the first page of a new journal (or a new blog) waiting for words. As long as it remains white and untouched, anything is possible. Make the first mark, take the first step, and you’re committed to a direction, a pattern. But wait just a few minutes longer, hold your breath, imagine the hidden potential waiting under the snow….. For those few moments, all possibilities exist. Anything can happen. It happens at the same time every night — just before dark. 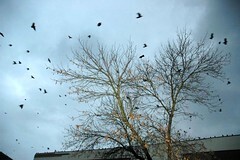 One by one, winged black silhouettes begin to move across the sky. All over the city, as if in response to some mysterious signal, they abandon their day-time haunts, rise up and join the exodus. By ones at first, then twos, tens, hundreds….. they head in the same direction — silent, purposeful.